The infographics for Prepaid Gold Forward Sales Contract explains how a gold buyer may receive 20% to 30% profit on purchasing gold that is directly produced on new and emerging mining sites with deposits of gold bearing ores. The process of purchasing the Goldivanti® Investment Gold creates true wealth, as newly produced gold, dug, processed and recovered gold out of gold mining business creates true new wealth. This way the investor and buyer of gold bullion benefits together with the gold mining company. The only way to obtain discunted gold is either by gold stream financing agreements or Prepaid Gold Forward Sales Contract. Click on the infographics to see the original picture. Company GOLDIVANTI LP is Scottish Limited Partnership for gold trade and mining since 2009. The Goldivanti® Prepaid Gold Forward Sales Contract is a gold mining investment opportunity where gold buyer obtains 20% to 30% expected profit on each purchase. Gold buyer does not enter risks of gold mining. Our company GOLDIVANTI LP is acquiring new mining equipment and expanding our mining site. One part of produced gold is delivered to gold buyer in form of a hallmarked gold bullion, or gold coins, depending of the agreement, and upon each of 250 grams produced. Minimum order is 1 to 2 kilogramns. For larger orders special agreement have to be devised. The contract is on one year with expected delivery time of 6 months, repeatable up to 3 times per year. 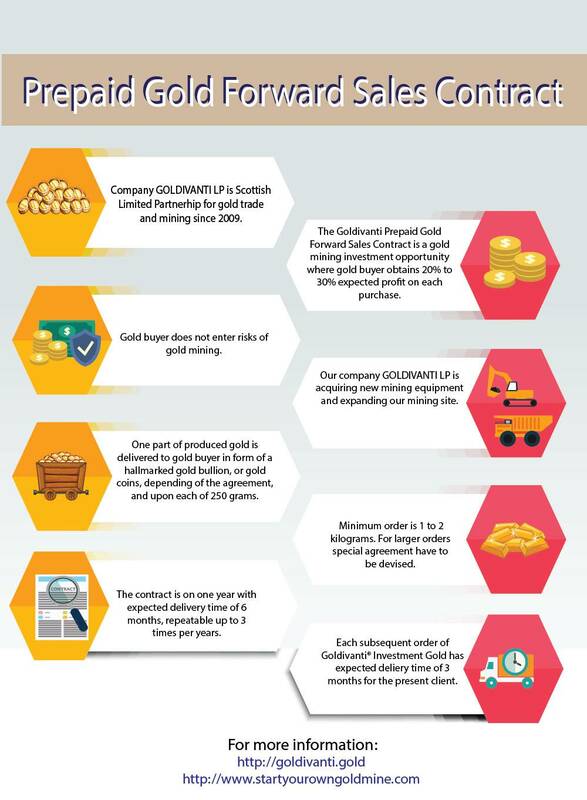 Each subsequent order of https://goldivanti.gold has expected delivery time of 3 months for the present client. For more information contact GOLDIVANTI LP or Start Your Own Gold Mine company.